The last pic is amazing,isn't it? Nice pictures. 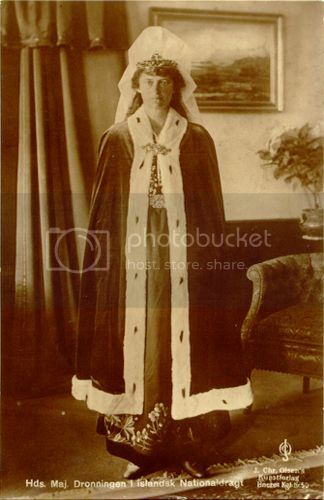 The last is the queen in the natinal dress of Iceland, that time under Denmark. The king and the queen had a very happy marrige thrugh 49 years. King Christian vas a strict person such as many military men at this time. The queen was not charming like Cecilie I know, but she was a very varm, kind and very much loved queen in Denmark. The couple lived a very plain life. Her sons adored her. You think he was strict to the empress, offcource he was. The danish kingdom have never been a rich kingdom, and the empress know that from she was a litlle girl, but she have lived more years in glitter and overwhelming richdom in Russia then in poor in Denmark and she like glitter and it was sure not easy to put out the habit and not be the person who decide. All people at this time in Denmark ecenomize light and so on. Alexandrine struck me as someone who was of a less flashy, more settled kind of person. Much like Queen Mary, she seems a rather reserved personality (though not unkind) who probably developed more steady tendencies after growing up with a mother who may have been charming but didn't exactly provide one with the most stable of upbringings. Alexandrine's mother, the former GDss Anastasia Mikhailovna, was very unpopular in Mecklenberg-Schwerin and eventually absented herself entirely from the area after being widowed. Thus someone steady and dutiful probably appealed to her as opposed to the more fun-loving and glamorous Cecile who would've enjoyed (at least when she was younger) the more flamboyant Crown Prince of Germany. The 2 sisters reminded me somewhat of Eleanor and Marianne in Sense & Sensibility--remarkably close despite their differing personalities. Christian and Alexandrine's wedding actually took place at Cannes rather than Schwerin because of Anastasia's loathing (though she did insist the Grand Duchy pony up for the trousseau). The bride was 18. Cecile admitted she freely cried for missing her sister and the emotions of the day even got to Alexandrine. 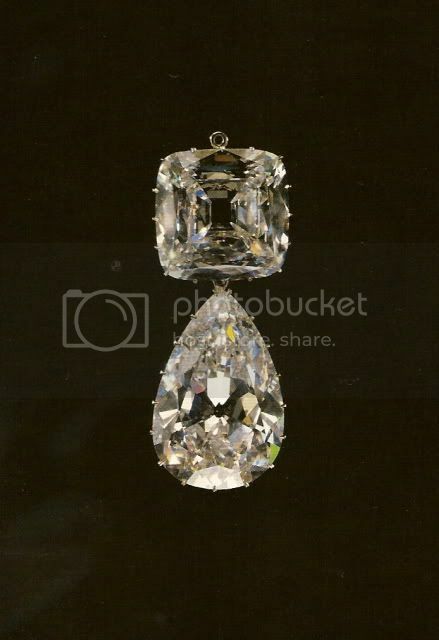 Alexandrine received several niece gifts including a tortoise shell fan engraved with diamonds from the Prince and Princess of Wales and a sapphire and diamond necklace from Nicholas and Alexandra. 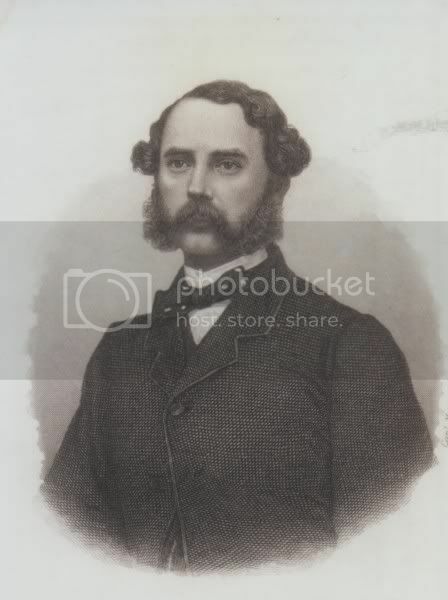 Christian IX and Louise weren't able to attend because of age and health but arranged a gala dinner and celebrations in Copenhagen the night of the wedding. I don't know if Alexandrine basically acted as the first lady of Mecklenberg-Schwerin in the absence of her mother (I would think so) but she proved much up to the task in Denmark. Queen Louise wasn't to live much longer and 'Aunt Swan' had no taste for society. Alexandrine was a private personality but, dutiful, young and attractive, proved a popular figure. The marriage of these 2 serious-minded people proved successful and 2 sons were born within the next 2 years. Alexandrine reminds me in other ways of Queen Mary--besides being reserved and shy, she married a gruff, temperamental sailor who scared their children (not surprising given the excessively strict upbringing he endured at the hands of Aunt Swan) and with a love of the arts which her husband didn't share but which she passed on to at least one of her sons (in this case the heir, Frederick). Unlike Mary, however, she was a much easier figure in regards to her sons who adored her. (She also didn't share Mary's love of jewellery!) However, again like Mary, she didn't stand up against Christian X when it came to discipline but was able to show them more affection herself. She and Frederick came to share a deep love of music and Alexandrine was a devotee of Wagner, even attending the festivals in Bayreuth and was a familiar figure at various concerts in Copenhagen. 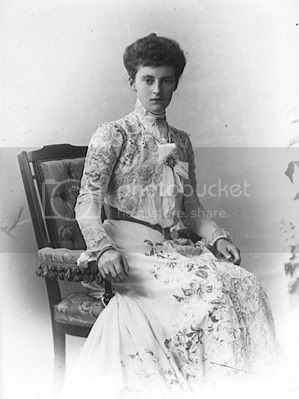 Along with Crown Princess Margaret of Sweden, Alexandrine, with her connections, acted as a conduit between relatives who found themselves on opposing sides of WW1. She would receive letters and recopy them herself and send them on. 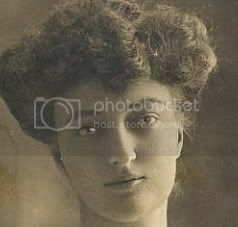 She helped the Dowager Duchess of Coburg (cousin of her mother) to keep in contact with her daughters Grand Duchess Victoria and Queen Marie of Romania. It must've been particularly difficult on Alexandrine as both her siblings were in Germany--one the Crown Princess--and her mother was in France out of reach. Once the war was over, however, she resumed her close relationship with both her siblings and the families attended each others celebrations (birthdays, anniversaries, etc...) in each country. A sensitive person (as many shyer people seem to often be) she was apparently so ashamed of CX's treatment towards MF that she was known to have burst into tears on at least one occasion. Again though, she didn't possess the force of personality to stand up to him. It was at this impasse that George V stepped in between his warring aunt and cousin and settled the annuity on her to help ease tensions over money. CX showed his best colors during the German occupation of Denmark during WW2. Until his health faltered, he would ride out daily through the streets of Copenhagen much to the consternation of the German authorities. It was through this spirit that he became such a national symbol to the Danish people. It wasn't easy on Alexandrine though and she accompanied him to the stables each morning and waited anxiously each day for him to return--even greeting him at the front door herself. According to his granddaughter Queen Margarethe, he didn't actually wear the Star of David as has been reported, but the Jews in Denmark apparently weren't forced to. Confusion seems to have come from a remark that if they were made to CX would be the first to join them. Life wasn't easy for he and Alexandrine as there were 2 bullet holes in his study at his summer palace and Germans were seen to lob grendades into the Amalienborg gardens. Between these dangers and the King's decreasing health, Alexandrine had a good deal of personal worry in addition to the stresses of the war itself. When the country was finally free, Christian and Alexandrine opened the first new Parliament to great acclimation. However, much like George VI in England, his health was permanently damaged by the stresses and he died in 1947. Alexandrine outlived him by 5 years. She had retreated from the public eye more and more, giving way to her vivacious daughter-in-law Ingrid (daughter of Crown Princess Margaret of Sweden and a great-granddaughter of Queen Victoria) who had married Frederick in 1935. She continued to be involved with her various charities and maintained her musical interests. Increasingly though her health was declining as well. The stress of the war years had been compounded by her devoted nursing of her husband in his final years. She was always with Frederick & Ingrid and their daughters for Christmastime though and Queen Margarethe remembers her with affection and with the way she spoke Danish and English (to Ingrid) with a slight accent despite her 50 years away from Germany. Soon before her annual Christmastime stay, she fell in with an intestinal complaint. She was admitted to a hospital and an operation was performed but her condition didn't improve. On Dec 27, 3 days after she turned 72, a bulletin was put out that she had slipped into unconsciousness and she passed away the next day. Ingrid would write to Nancy Astor that Alexandrine had proved 'a very kind understanding' MIL who never 'mixed up in our affairs. She adored my husband & admired him tremendously, perhaps that was not a good thing always in his young days, but he certainly deserved it now.' Despite the bitter cold and a heavy snowstorm, 10,000 Danes came out to pay tribute as she was laid to rest in January 1953. As the coffin appeared, the crowd spontaneously burst into the singing of a hymn. It is a testament to Alexandrine that her patriotism had never been questioned despite her German birth during two world wars. The ceremony was a simple one in keeping with her nature, with no sermon, just a brief reading of biblical texts. Her bier was transferred to Roskilde Cathedral to lay beside her husband of almost 50 years. I recently received my dvd of A Royal Family (I can't praise it enough!) and there was a home movie clip of Christian X and Alexandrine on the beach. She was in a bathing suit, hugging her knees to her chest and rocking back and foreward! It was so cute! It was nice to see her "letting her hair down" so to speak! Now as for Frederick IX's leopard print speedos.... LOL! Thank you,Ella,for info on Alexandrine!Very-very interesting!!!! That was a very concise yet insightful precis of her life GDElla. What a sensitive person she sounds. I particularly loved your comment about her patriotism never being questioned, through two World Wars. She must have been terribly popular. I guess the reason that Thyra's daughters were in the wedding party was because they were cousins to the groom. Do you think that was there closest connection or was there another reason for them being in the wedding. from the top of the ocean to the bottom of the sky. I think the Cumberland girls being Christian's cousins was probably the link--I don't know if the Mecklenberg-Schwerins and Cumberlands socialized much since Thyra and Ernst spent so much time in Austria. All the cousins seemed to be very close so it would make sense to put those of age in the wedding. 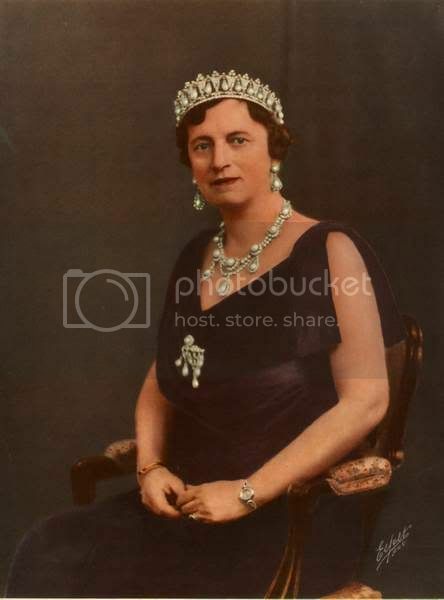 Any regal paintings of Queen Alexandine? Coryne Hall, the well respected royal author, wrote an excellent article on Queen Alexandrine of Denmark for The European Royal History Journal in one of our issues a couple of years ago. I would like to see so much the normal portrait of Queen Alexandrine wearing Ruby parure,because I saw once only one but that portrait was too small and you can't see the beauty of the painting,and of the Queen also...so that's why I asked if anyone has it...? Sorry, just a small one. The only big one I have is this. cant see the photos from granduchessella. plus have any better & bigger, photo's of queen Alexandrine. Her sister Cecile was she killed in 1937, airpale crash? It was Cecilie of Greece and Denmark(sister of Prince Phillip) who was killed in aeroplane crash in 1937!